except maybe Stevie, whose nightmares are telling him that Herobrine is going to take over the Overworld. His cousin Alex has come to visit, and during one of her explorations, she finds a music disc that predicts the destruction of the Overworld! Are Stevie’s nightmares and the music disc connected? Stevie and Alex hook up with Stevie’s best friend Maison, and the three quickly begin looking for answers. 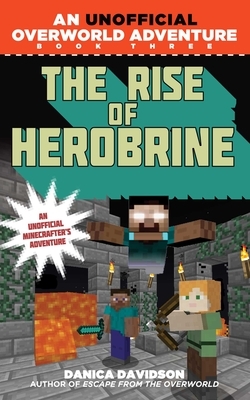 While they look, Herobrine is drawing ever closer. Someone is stealing the villagers’ most precious belongings, including Stevie’s cat, Ossie. People are angry and turning against one another. And there are mysterious signs appearing around the Overworld. Stevie, Maison, and Alex must unearth more music discs, piece together clues from the nightmares, and, ultimately, confront Herobrinethe most feared being of allat his dark home in an abandoned temple high atop a forbidding mountain. The fate of the Overworld is depending on them.